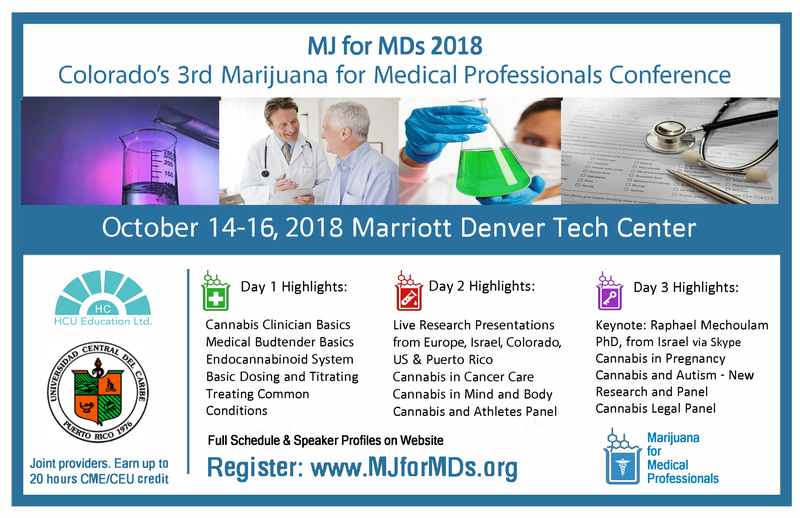 The 3rd Marijuana for Medical Professionals conference is happening October 14-16th 2018 at the Denver Marriott Tech Center. Offering 15+ CME/CE credits, this gem of all conferences is truly geared for doctors, nurses, caregivers and all medical professionals! Marijuana for Medical Professionals 2018 (aka MJ for MDs) offers certified Continuing Medical Education for physicians, nurses, and clinicians. Plus, expert training with CE credit for budtenders, dispensaries, MIPS, and labs. The line up of global speakers is AMAZING! We will have top tier presenters including doctors, nurses and researchers from the US, Israel, France, Puerto Rico and Canada. Please help us get the word out and invite your friends, especially doctors, nurses, researchers, public health policy officials, House Representative and Senate officials. There is even a scholarship program for health students! Visit MJforMDs.org — we need your support for this education among the medical community. Please share! Single & 2-Day CME/CE tickets range $295-795 | Use BOGO promo code: Bogo25-2018 for a buy one get one free ticket. This event accepts refunds until 3 day(s) before the event.